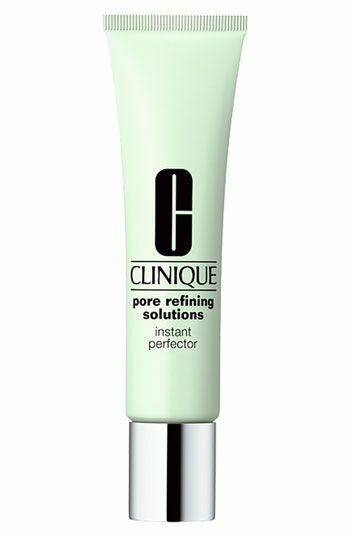 Pore Refining Solutions Instant Perfector of Clinique offers up to 8 hours of sweat & humidity resistant effect. 50% or more of smaller pores ad the best is that you have to wait only… well… they promise an instantly smooth and flawless skin appearance. Who dares to offer such amazing results? No one else than CLINIQUE. Looks very nice, right size, I like that color for the tube, it surprises when you open the so delicate decorated box has and the little bright cap looks nice, but needs some practice if you try to close it just after taking the amount of product, is so silky. Still, love it. In my professional opinion Pore Refining Solutions Instant Perfector works much better when you apply it over a Correcting Serum, makeup, and for touch-ups. No need to worry about your Skin Type this is an all skin types product. We want to confirm specifically the instantly Natural-looking matte finish offered, like that date day you need to look perfect but you have neglected your skin care a little bit. I am ok with Pore Refining Solutions Instant Perfector consistency and how absorbed into my skin, just keep in mind that since there are 3 shades available you might want to get the right one for your skin tone and better results, or try all of them since 3 is not a big number, not as big as 50 shades of Gray… Mmm. Due to some ingredients better get a demonstration to make sure you do not get a reaction now if you know as a matter of fact that you are allergic to any of the ingredients listed on the box then, just don´t. There are more than 50 other options for the same purpose. If you use Pore Refining Solutions Instant Perfector after your correcting serum, make-up or for simply touch-ups there is an instant effect that lasts for a Cinderella night. Yes we recommend the Pore Refining Solutions Instant Perfector. Good jib Clinique! Ingredients: Cyclopentasiloxane, Dimethicone, HDI/Trimethylol Hexyllactone Crosspolymer, Silica, Isononyl Isononanoate, Isododecane, Dimethicone/Vinyl Dimethicone Crosspolymer, Vinyl Dimethicone/Methicone Silsesquioxane Crosspolymer, Polymethyl Methacrylate, Lauroyl Lysine, Hydrolyzed Soy Protein, Ethylhexylglycerin, Stearyl Glycyrrhetinate, Phytosterol/Octyldodecyl Lauroyl Glutamate, Methicone, Tocopheryl Acetate, Coconut Acid, Water, Phenoxyethanol May Contain: Mica, Titanium Dioxide, Iron Oxides, Carmine. I tried this last week, and cant believe how good it is!